It was a normal night at the A.D. Club when Ryan Donato reached for his vibrating phone. The call was from the late Jim Johannson, senior U.S.A. Hockey executive and then-general manager for the 2018 American Olympic squad. What happened next changed the junior forward’s career—and life—forever. Yes, Seb. It was. Sitting in the A.D., one of Harvard's all-male final clubs, Ryan first heard the news he would officially represent team U.S.A. in the 2018 Pyeongchang Winter Olympic Games. All Donato could do was thank Johannson for the opportunity of a lifetime and beg Lloyd not to divulge the secret. Wearing your country’s colors ranks among the highest possible distinctions an athlete can earn. 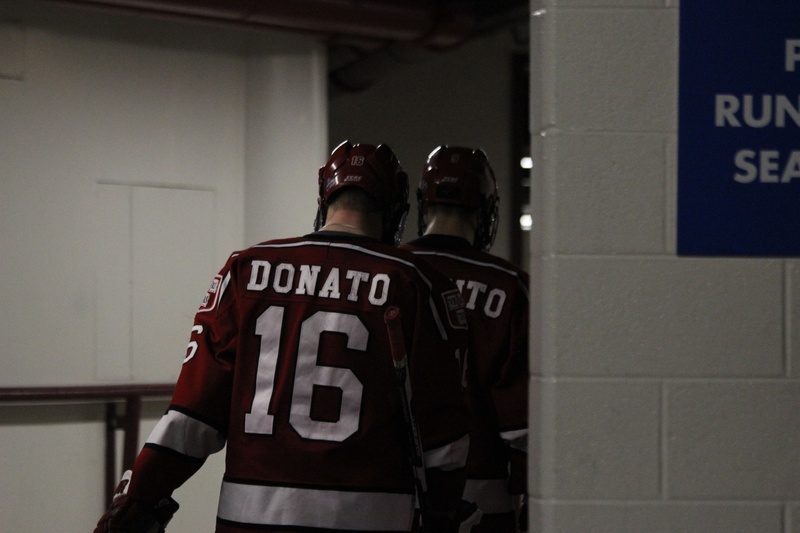 For Donato, the sheer rarity of the opportunity makes it that much sweeter. For the first time since 1994, the National Hockey League is forbidding its players from competing in the Olympics. This decision, while widely unpopular among fans of the league, has opened the door for skaters not otherwise in contention for a roster spot, namely overseas professionals and American players with minor-league-only contracts. Johannson and team U.S.A. head coach Tony Granato did, however, dip into the college ranks to round out the roster for the 2018 Games. And that’s where the timing of the NHL ban worked in Donato’s favor. This is not to say the junior hasn’t earned a spot on this year’s team—his 21 goals lead the country, and he left for South Korea as a major contender for the Hobey Baker Award, given to the top National Collegiate Athletic Association player of the year. But recent history depicts a clear trend, and this trend typically doesn’t bode well for current college players with Olympic aspirations. Ryan Donato has a killer instinct this season that hasn't been seen before, even in his point-per-game campaign last year (21–19—40). America’s last five rosters have been occupied entirely by NHL players, and the last time a Harvard iceman represented U.S.A. Hockey in the Games while still in school came in 1992, when Ted Drury ’93 donned the red, white, and blue. So the league’s absence from the Games this year formed just the stroke of luck Donato needed to cash in on his stellar play to date in the NCAA season. Incidentally, Drury wasn’t the only Ted of note on that team, which placed fourth in Albertville, France. Ted Donato ’91, Ryan’s father and coach for the Crimson, also skated for the stars and stripes that year at the outset of his 796-game NHL career. 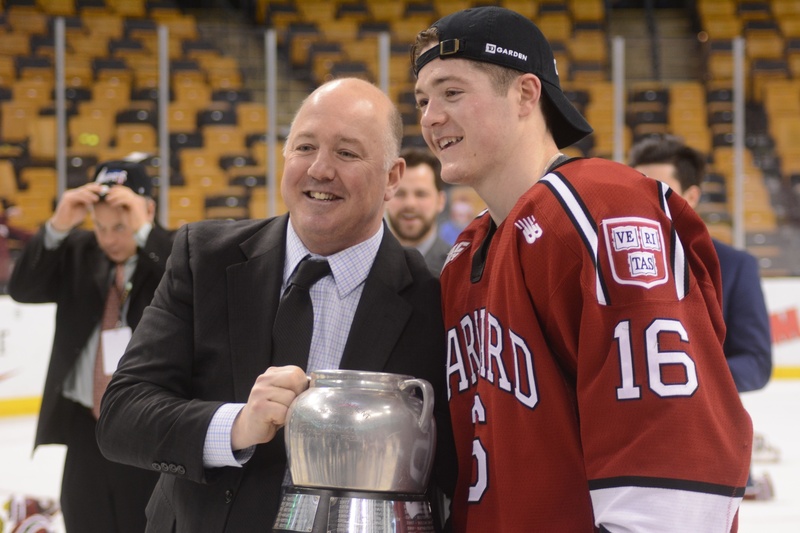 Coach Donato said he thinks his son's opportunity is once-in-a-lifetime. In short, even the greatest college hockey players haven’t had the Olympics on their radar in over two decades. That all changed late in the summer of 2017. Without guaranteeing anything, Johannson hinted that Donato was in the mix for a USA roster spot, and this entirely altered the mindset of the Boston Bruins prospect. Johannson's advice was simple: play your best, try not to worry about the Olympics quite yet. If it happens, it happens. Johannson reiterated, though, that U.S.A. Hockey would be watching. “I think I’m on the list for sure,” Donato said in an interview in October, discussing his situation. “I’ve been talking to some of their staff, but... what they’ve told me is just focus on your season." "My tryout is how I play at the beginning of the season and how I play up until February," he added. Donato’s play early on in the campaign comprised a convincing start. The Scituate, Mass., native inked the score sheet in each of his first 14 contests and kept the Harvard offense afloat after graduation eliminated one of the team’s forward ranks. Another element key to Donato’s season, as far as his parents and U.S.A. Hockey are concerned, has been the junior’s clean bill of health. Coach Donato said he could breathe a sigh of relief after his son boarded the plane to PyeongChang in one piece. In this way, Donato can already check off step one of his Olympic journey. But he and his father would argue that this journey started well before this season. Growing up the son of an NHL player, Ryan “always knew” he wanted to play hockey. The game left an indelible mark on his childhood, whether through watching games on TV or running around arenas where his father played—though, as coach Donato pointed out, back then he was less focused on his father’s game and more intent on fooling around with the other players’ sons. Despite much of his focus necessarily being on the ice, the elder Donato noticed his son’s budding love for hockey and embraced it. Ryan was eager to hone the skills required for high-level hockey, so he threw himself into the game. After successful stints at Dexter School, the Massachusetts Selects Hockey League’s Cape Cod Whalers program, and the United States under-18 national team, he was drafted by the Boston Bruins in the second round. A future in hockey had started to crystalize. 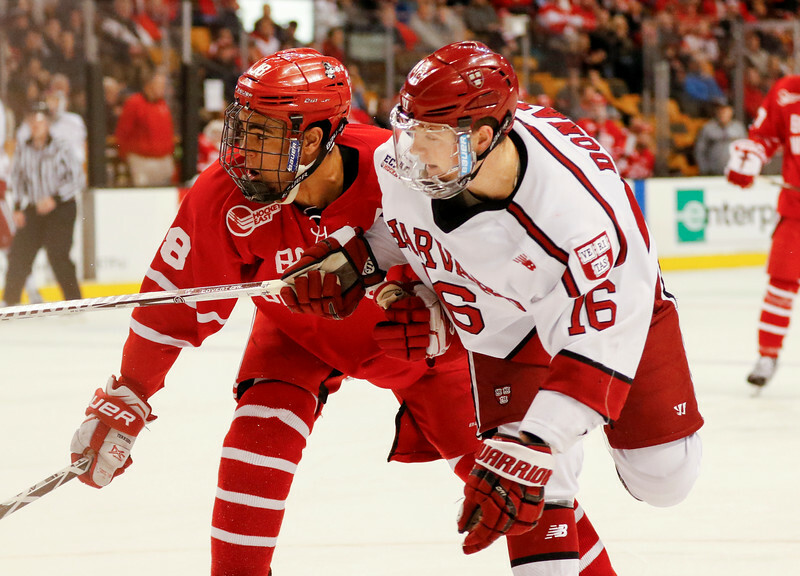 Since his freshman year at Harvard, Donato has won a bronze medal with the American team at the 2016 World Junior Championships and has skated alongside some talented linemates, including now-NHL forward Alexander Kerfoot ’17. And while he has donned multiple jerseys over the course of his young career, Donato has practically grown to expect a blood relative behind the bench. In some form or another, a family member has been barking hockey instructions at the junior since since his first year at Dexter, where his uncle Danny still coaches. Both unable and unwilling to skirt his Harvard obligations to follow Ryan’s Olympic play, coach Donato said he is looking forward to finally playing just the father again. “I’m trying to help in any way I can, but ultimately, I’m really just there to support him,” coach Donato said. He couldn't quite prevent himself from sharing some nuggets of advice, though, given his own experience at the international level. Ryan himself has seen the impression that professional hockey—in particular, international competition—has made on his father’s life. Donato will thus heed his father's advice in hopes of finding an experience as meaningful as his father's this February. Hockey is—and always has been—one of the most significant parts of the junior’s life. In this respect, he is certainly following his father’s footsteps. The game has been so integral that it was almost strange for Ryan to articulate its typically unspoken importance. “Hockey is... ” he paused, as if searching for the right words. “Everything for me. My family’s connected to hockey, my school life’s connected to hockey, my religious life is connected to hockey." "If I didn’t have hockey, I’d be a completely different person," he added. Pyeongchang marks simply the next chapter in a life dedicated to hockey. Donato is preparing to author these pages, and while there are no current NHLers on the Olympic team, there’s much to be gained from playing with experienced pros. For now, it is not totally clear how coach Granato, normally the bench boss at the University of Wisconsin-Madison, plans to use Donato. Anyone’s best guess is that the 6’0” centerman, who will likely play wing in the Olympic tournament, will assume the role of offensive spark plug on a team that may lack some firepower. Adding to Donato’s excitement, he said he has received congratulations from the usual family, friend, and high school cohorts. But more unique, perhaps, are the words shared by Vice President Mike Pence, who will lead the American delegation at the Olympics. Earlier in the week, Pence penned a letter to Donato and his town of Scituate offering his congratulations. Any reservations Donato may have about his youth are mitigated by the fact that three other college players will suit up alongside him. Among them are St. Cloud State defenseman Will Borgen, Donato’s former teammate in the USHL and at World Juniors, and Boston University forward Jordan Greenway, whose Terriers squad ousted the Crimson this past Monday in the Beanpot semifinals. 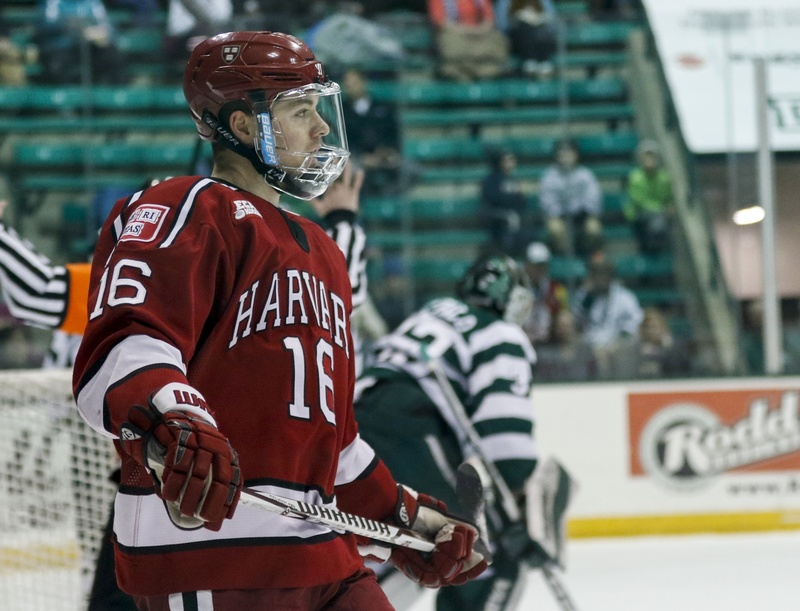 Between the Beanpot heartbreaker and the unrelenting conference schedule, Donato’s Harvard teammates could not give him a formal send-off before he boarded the plane to South Korea Wednesday morning. Plus, Ryan’s departure is surely bittersweet for a Crimson group that has struggled to beat the goaltender recently. 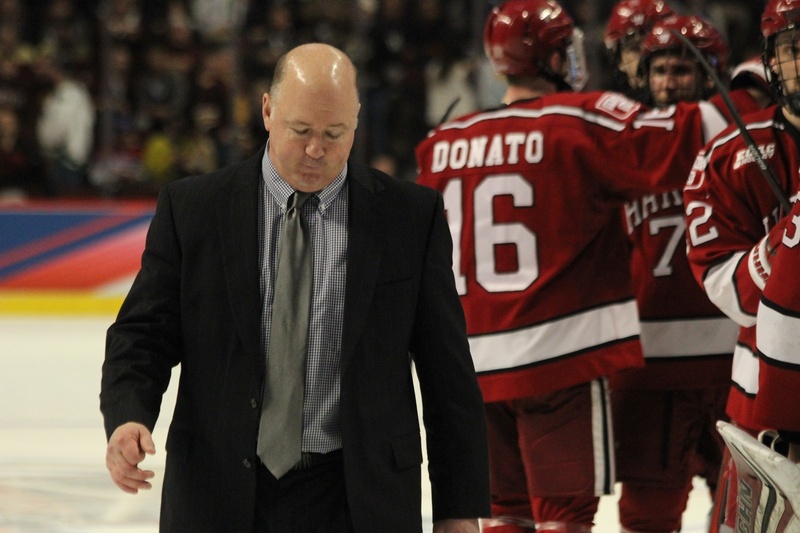 Donato’s long-term future with Harvard is just as uncertain. With the Bruins showing all the signs of a Stanley Cup contender this season, Ryan could be calling TD Garden his home ice sooner rather than later. For now, the forward will make the most of the opportunity he has been given—partially by sheer luck, and partially, of course, by sheer skill. However fortuitous the timing and however rare the NHL’s boycott, “Ryan Hockeynato”—once just the curious son of an NHLer, and probably still a mini-sticks enthusiast—will soon sport the stars and stripes as he embarks on arguably the most honorable journey in all of sports.